Last week, Nina Olson as the National Taxpayer Advocate (NTA) cited tax complexity as the most prominent issue facing taxpayers in her annual report to Congress. To most of us, this is no surprise. We either gruelingly spend hours scratching our heads as we try to fill out our tax returns or, like a majority of taxpayers, pay someone else to handle our tax returns. Nina Olson presented the facts and figures that capture our agony. Congress has consistently added to and altered our tax code 4,680 times since 2001, averaging more than one change per day. 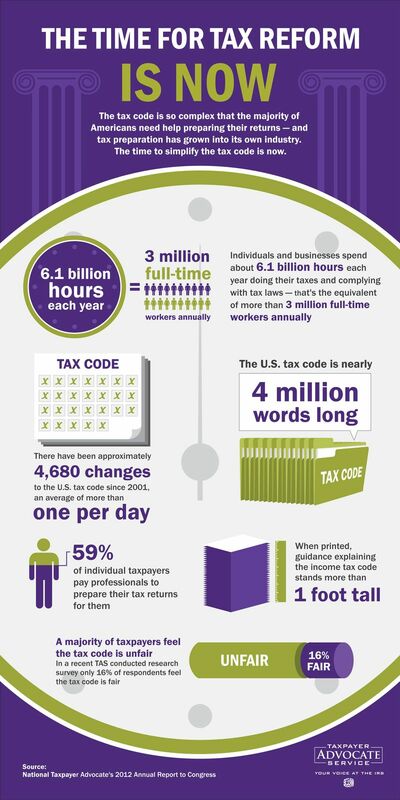 The tax code now totals almost 4 million words, which is about five times the length of the Bible and five times the length of the Federal Tax Code in the 1950s. Americans spend 6.1 billion hours every year attempting to comply with the internal revenue code, at a monetary cost of about $168 billion. Due to the complexity of the tax system, 59% of individual tax payers hire tax preparers to complete their returns while another 30% of individual tax payers pay for software to facilitate their tax returns. The average taxpayer spends about $258 dollars in out of pocket expense to comply plus about 18 hours of time. All in all, the growing complexity of the tax code, riddled with income exclusions, deductions, and credits, raises the opportunity cost of tax compliance. Time spent completing tax returns or the cost of hiring a tax preparer shifts resources away from more productive avenues. Further, the constantly changing tax code heightens uncertainty among taxpayers. Instead of fostering an efficient and productive economy, the tax code leaves taxpayers with headaches and frustration. In sum, Nina Olson once again reminds us of the failings of our tax code in terms of complexity and compliance. Her suggestions for improvement are sound. By these standards, the recent fiscal cliff deal, and virtually every tax deal of the last decade or more, has only made the problem worse.